Film library abandoned for movie-going -- possible romance? 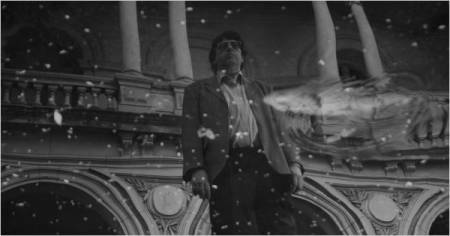 Federico Veiroj's succinct (67-minute) feature was shot in color and converted to black and white to suggest old movies -- which are the chief concern of Jorge (played by film critic Jorge Jellinek), the protagonist. He is a big, tall, amiably nerdy, pear-shaped man with tinted glasses, out of style like his clothes. He is the manager of the Cinemateca Uruguaya of Montevideo, Uruguay, and he has been doing this for twenty-five years, but it's beginning to look like that may soon come to an end. He and the director confer, trade film series to watch, go over the declining fortunes and physical plant of their operation. The film library may be disintegrating. Ticket sales are not brisk. The projectors are in need of multiple repairs. Even the seats in the auditoriums are giving out. The director's and manager's weekly radio broadcasts are charming, smooth, but rather dry. The director uses a microphone to broadcast live translations in Spanish into the auditorium of the English subtitles for von Stroheim's Greed. For a while this movie looks like it's going amiably nowhere, though its loving contemplation of outmoded technologies -- tapes, faxes, telegrams, pay phones, Russian projectors with special lights no longer replaceable -- has the atmospheric charm of a world where people are excited about Italian films of the Sixties; The Cabinet of Dr. Caligari; or the way Prokofiev's music shapes the battle sequence of Alexander Nevsky and the structure of Citizen Kane becomes clear only after multiple viewings. Then outside the Cinemateca Jorge meets an old friend called Paola (Paola Venditto), who has come for a screening. He gives her a comp ticket. He waits patiently for her to come out and invites her for coffee. No, she says, she has too many exams to grade. But she shows interest. Suddenly a little flower opens up. And a big flower closes. The corporation that has been supporting the Cinemateca announces to Jorge and his boss, the director (Manuel Martínez Carril, actual former Cinemateca director) that it can unfortunately no longer support organizations that do not show any profit. Meanwhile the landlord threatens eviction within a few days because the rent has not been paid for eight months. A Useful Life turns gradually around after the Cinemateca is closed. Jorge does a little dance, literally and figuratively. He gets an expensive haircut, one so elegant you can hardly tell his hair has been cut at all, though it's been beautifully washed and combed. He skips up and down some big marble steps, as if remembering a Fred Astaire routine. Then he goes to the university, where he enters a classroom along with the students and gives an impromptu and surprisingly fluent little lecture on the nature and necessity of lying -- till the real professor comes in and he departs. Finally he waits outside the university buildings until he finds Paola coming out of her class, and asks her: Would you like to go to the movies? "The movies?" Paola asks, pausing. Why yes, she would. And with old movie music playing in a montage of classic finales, Paola and Jorge go off into the magical darkness of the streets of downtown Montevideo as evening falls. It is a beautiful and hopeful ending. Veiroj is working with things he knows and people he knows. The actors are not far from their real selves, and unlike some cases of that, they fit into themselves comfortably. Veiroj himself worked at the Cinemateca. (It has not, in reality, been forced to close.) But above all the film captures a slow pace and gentle end-of-the-world melancholy that perhaps only Uruguay, or the Patagonia of Carlos Sorin, can evoke. Special kudos to the director for his skill in using non-actors, in particular the way he makes Jorge Jellinek come alive and seem, after all, an attractive man. The fancy hairdresser brings that out: middle-aged though he may be, Jorge has beautiful thick head of glossy black hair. His radio talks and impromptu university lecture show his silver tongue. And his towering height, as the dance up and down the stairs shows, is both impressive and nimble. Una vida útil is a simple but accomplished film, a short-short story rather than a novel. It develops its milueu and its characters with a sure touch. You might want to contrast this with Davide Ferrario's more commercial and elaborate After Midnight/Dopo mezzonotte (2004), starring Giorgio Pasotti, a film in which the magical Mole Antonelliana (the cavernous Museum of Cinema in Turin, Italy) is the setting for a very unlikely love story. Not as economical by a long sight (the plot gets a bit complicated at the end), but the setting is remarkable. Shown as part of the San Francisco International Film Festival of April-May 2011. The film opened in Uruguay in August 2010, in Canada and Spain in September. It had a brief run in New York in January 2011 and was a New York Times Critic's Pick reviewed by Jeannette Catsoulis. Global Film Initiative is the distributor.